Assume we have a live performance of three singers at different positions. Using spatial audio systems like Wave Field Synthesis we might be able to synthesize their corresponding sound field in a way that we are convinced they are exactly at those positions they were during their actual performance. But what we most probably not be able to synthesize correctly is the timbre of those singers and listeners will perceive a coloration compared to the original performance. We did different listening tests where we investigated the amount of coloration listeners perceive in different Wave Field Synthesis systems with a varying number of loudspeakers and the distance between adjacent loudspeakers. The Two!Ears model has a ColorationKS that is able to predict the amount of coloration compared to a reference. The model learns this reference on the fly by choosing the first audio input it gets after the start of the Blackboard system. In the following we show you how to get the results for listening tests from our database and how to use the Two!Ears model to predict the data. The Database contains lots of so called human labels, which are varying data, that all comes from listening tests and has somehow human behavior as input. This can be in the form of direct rating of specific attributes like localisation or coloration, but also indirect input like measurements of the head movements of the listeners during their tasks. In the following we are interested in modelling the results for the coloration experiment performed with WFS, which is described in 2015-10-01: Coloration of a point source in Wave Field Synthesis revisited. We did the experiment for different listening positions, loudspeaker arrays, and audio source materials. In this example, we will focus on the central listening position, a circular loudspeaker array, and speech as source material. The first column of humanLabels lists the corresponding BRS file used during the experiment, the second column the median coloration rating – ranging from -1 for not colored to 1 for strongly colored – and the third column the confidence interval of the ratings. The anchor condition, which is the very last entry, was rated to be even more degraded than 1. This reflects that the model is more optimised for comb-filter like spectra at the moment and not for strongly low- or high-passed signals. Fig. 77 Median of coloration ratings (points) together with confidence intervals and model prediction (line). 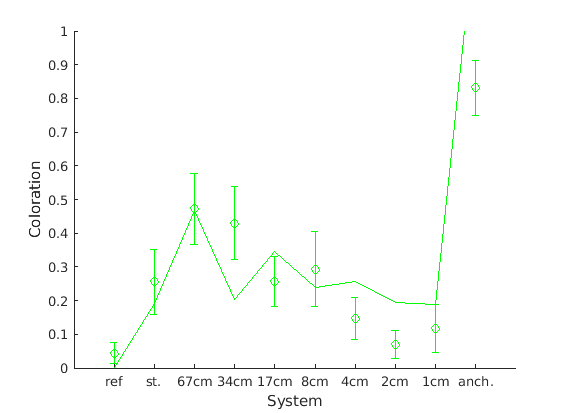 The centimeter values describe the inter-loudspeaker distances for the investigated WFS systems.